MILWAUKEE - After watching Milwaukee win its sixth straight against the Rockies, Colorado manager Walt Weiss had a simple explanation for the Brewers' success. "They've been good against everybody," he said. Carlos Gomez launched a three-run homer and Matt Garza battled into the seventh inning for his first win in four starts to help the Brewers continue their mastery of the Rockies with a 7-4 victory Saturday. "They've got the best record in the National League," Weiss said. "They're doing everything well. All aspects of their game are rolling right now. They're getting good starts, the bullpen has been very good and it's a potent lineup. You put all those things together and you've got 50-plus wins at this point." Garza (5-5) pitched five scoreless innings before allowing two runs each in the sixth and seventh. His first win since June 7 helped the Brewers improve to a season-high 19 games above .500 at 51-32. They also are 6-0 against the Rockies this season. Francisco Rodriguez, who got the victory Friday night despite blowing the save, pitched a perfect ninth inning for his majors-best 27th save. "I've never played with an offence as good as this," said Garza, who is 3-1 in six June starts with a 2.88 ERA. "When I played with Tampa, we were lucky to scratch out what we could. Chicago, you know the story there. You just keep going. It's a different type of mindset. When you get runs this quick, you have to keep attacking. You can't let up: stay aggressive, go after these guys and not give in. 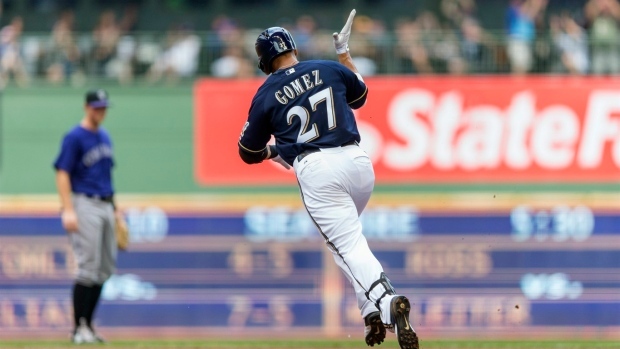 Gomez staked the Brewers to a 3-0 lead in the first with his 13th home run. Ryan Braun and Jonathan Lucroy reached on consecutive singles and Gomez then drove a 3-2 pitch from Jhoulys Chacin (1-7) over the centre-field wall. "I just tried to keep it simple," said Gomez, who left the game in the seventh inning with a left neck strain after colliding with Braun in the outfield. "They got me out the whole series in Colorado and here. I didn't expect that pitch in. It's supposed to be a ball and I put good contact on it, I didn't try to do too much and that's how I did it." The Brewers added three runs in the fifth to make it 6-0. Jean Segura singled to open, advanced on Garza's sacrifice bunt and moved to third on Scooter Gennett's infield single. Braun followed with a triple into the corner when right-fielder Charlie Blackmon missed on a diving attempt at the sinking liner. Braun scored on Lucroy's groundout. Colorado got two runs in the sixth after loading the bases with three consecutive one-out singles. Drew Stubbs' bloop single to shallow right drove in one run and Troy Tulowitzki followed with a sacrifice fly. The Brewers answered with a run in the bottom of the inning on Lyle Overbay's RBI single to increase the lead to 7-2. The Rockies chased Garza with two runs in the seventh on a single by Wilin Rosario, a double by Ryan Wheeler and D.J. LeMahieu's two-run single. "Eight out of those nine hits they got, I thought probably weren't hard enough, but they're still hits," said Garza, signed to a $50 million, four-year deal, "Sometimes they fall in so you have to just keep making pitches. It's frustrating but we still came out with a 'W' so it is what it is. I'll take the soft hits over them barrelling them up." In the third inning, the Brewers successfully challenged a call by first base umpire C.B. Bucknor. Josh Rutledge singled to open and LeMahieu followed with a liner to second baseman Rickie Weeks. The throw to first from Weeks hit Rutledge, who got back safely when first baseman Overbay couldn't corral the ball. Rutledge then came off the bag again, but dove back and was originally called safe on the tag by Overbay. The call was overturned after a review of 1 minute, 42 seconds. NOTES: The Brewers said Gomez is day to day. ... To eliminate the shadows between the mound and home plate during day games at Miller Park, the first-base half of the roof was closed, while the third-base side remained completely open. . Jabari Parker, the first-round pick of the Milwaukee Bucks and the No. 2 overall pick in the recent NBA draft, threw out the first pitch, wearing a Brewers jersey with his name and No. 12 on the back. The 6-foot-8 right-hander snapped off a one-hopper to the plate. . The third-inning challenge was the Brewers' first since May 31. They are 6-5 in challenges. . Brewers shortstop Segura left in the sixth inning with leg cramps. ... Weiss unsuccessfully challenged a call when Tulowitzki was thrown out attempting to steal second to end the eighth inning.